32 (35, 40, 45¾, 51¾)"
Finished Size 32 (35, 40, 45¾, 51¾)“ bust circumference. Sweater shown measures 35”, modeled with 2” of ease. 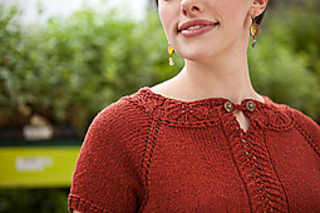 Yarn Shibui Knits Heichi (100% silk; 90 yd 82 m/50 g): #H115 brick, 6 (7, 8, 9, 11) skeins. 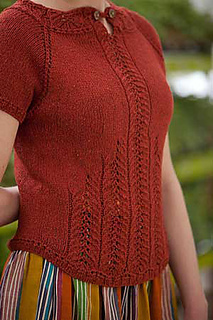 Needles Body and sleeves—size 7 (4.5 mm): 16” and 24” to 47” circulars (cir). Sleeve rib—size 6 (4 mm): set of double-pointed (dpn). Adjust needle size if necessary to obtain the correct gauge. Notions Markers (m); stitch holders; tapestry needle; size E (3.5 mm) crochet hook; two 5/8” buttons. Gauge 21½ sts and 29 rows = 4” in St st on larger needles; 28 sts in patt from Right and Left Front charts measure about 4½” wide on larger needles.